There is an endless array of takes on kimono in the modern day — they can be elegant or sheik; modest or bold; stiff or flowing; classic or vogue. In 2015, there are kimono-influenced products all over Asia and the West. Around Japan, women step softly through the streets in either kimono or yukata, reveling in the attention their colorful dress draws. Men might stroll by their side, also in traditional garb. Though the main part of kimono is the actual garment, aka the T-shaped body and the sleeves (“maemigiro,” “ushimigiro,” and “sode”), the most notable accent is the sash, aka the “obi.” Obis usually tie in to the overall design of the kimono, and give the get-up its character. 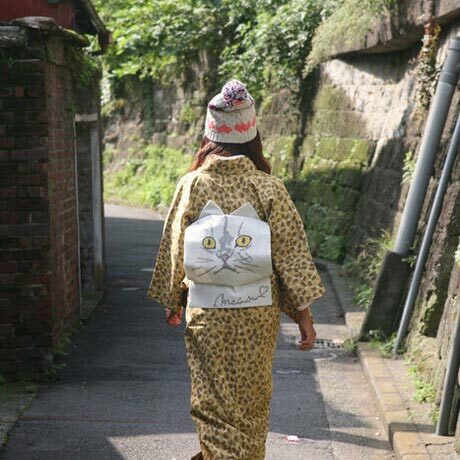 In the vein of modern kimono design, High Calory Otome recently released a cat-inspired obi that is chou-kawaii! The model in the photos is rocking it with a modern knit cap and a leopard-print kimono. The product was released in minimal numbers, and at the current time of this post is sold out. It runs for 18,900 yen (about $152 USD), is made of 100% polyester, and is produced through an inkjet process. The sash features a yellow-eyed cat whose ears mimic a traditional obi’s bowties, and has the face of a big white cat with a pink-button nose and whiskers. On the belly, there is a smaller golden cat who looks on with yet another bleak yet cuddly stare. Formal? No. Sylish? You betcha! A black cat obi, from Niko Antique, put little paw prints on your tummy. This pink Immortal Geisha sash allows you to take your favorite tabby for a ride on your back across town!